Arles ([aʁl]; Provençal [ˈaʀle] in both classical and Mistralian norms; Arelate in Classical Latin) is a city and commune in the south of France, in the Bouches-du-Rhône department, of which it is a subprefecture, in the former province of Provence. The river Rhône forks into two branches just upstream of Arles, forming the Camargue delta. Because the Camargue is for a large part administratively part of Arles, the commune as a whole is the largest commune in Metropolitan France in terms of territory, although its population is only slightly more than 50,000. Its area is 758.93 km2 (293.02 sq mi), which is more than seven times the area of Paris. The Ligurians were in this area from about 800 BC. Later, Celtic influences have been discovered. The city became an important Phoenician trading port, before being taken by the Romans. The Romans took the town in 123 BC and expanded it into an important city, with a canal link to the Mediterranean Sea being constructed in 104 BC. However, it struggled to escape the shadow of Massalia (Marseilles) further along the coast. Its chance came when it sided with Julius Caesar against Pompey, providing military support. Massalia backed Pompey; when Caesar emerged victorious, Massalia was stripped of its possessions, which were transferred to Arelate as a reward. The town was formally established as a colony for veterans of the Roman legion Legio VI Ferrata, which had its base there. Its full title as a colony was Colonia Iulia Paterna Arelatensium Sextanorum, "the ancestral Julian colony of Arles of the soldiers of the Sixth." Arelate was a city of considerable importance in the province of Gallia Narbonensis. It covered an area of some 40 hectares (99 acres) and possessed a number of monuments, including an amphitheatre, triumphal arch, Roman circus, theatre, and a full circuit of walls. Ancient Arles was closer to the sea than it is now and served as a major port. It also had (and still has) the southernmost bridge on the Rhône. Very unusually, the Roman bridge was not fixed but consisted of a pontoon-style bridge of boats, with towers and drawbridges at each end. The boats were secured in place by anchors and were tethered to twin towers built just upstream of the bridge. This unusual design was a way of coping with the river's frequent violent floods, which would have made short work of a conventional bridge. Nothing remains of the Roman bridge, which has been replaced by a more modern bridge near the same spot. The city reached a peak of influence during the 4th and 5th centuries, when Roman Emperors frequently used it as their headquarters during military campaigns. In 395, it became the seat of the Praetorian Prefecture of the Gauls, governing the western part of the Western Empire: Gaul proper plus Hispania (Spain) and Armorica (Brittany). At that time, the city was perhaps home to 75,000–100,000 people. It became a favorite city of Emperor Constantine I, who built baths there, substantial remains of which are still standing. His son, Constantine II, was born in Arles. Usurper Constantine III declared himself emperor in the West (407–411) and made Arles his capital in 408. Arles became renowned as a cultural and religious centre during the late Roman Empire. It was the birthplace of the sceptical philosopher Favorinus. It was also a key location for Roman Christianity and an important base for the Christianization of Gaul. The city's bishopric was held by a series of outstanding clerics, beginning with Saint Trophimus around 225 and continuing with Saint Honoratus, then Saint Hilarius in the first half of the 5th century. The political tension between the Catholic bishops of Arles and the Visigothic kings is epitomized in the career of the Frankish St. Caesarius, bishop of Arles 503–542, who was suspected by the Arian Visigoth Alaric II of conspiring with the Burgundians to turn over the Arelate to Burgundy, and was exiled for a year to Bordeaux in Aquitaine. Political tensions were evident again in 512, when Arles held out against Theodoric the Great and Caesarius was imprisoned and sent to Ravenna to explain his actions before the Ostrogothic king. The friction between the Arian Christianity of the Visigoths and the Catholicism of the bishops sent out from Rome established deep roots for religious heterodoxy, even heresy, in Occitan culture. At Treves in 385, Priscillian achieved the distinction of becoming the first Christian executed for heresy (Manichaean in his case, see also Cathars, Camisards). 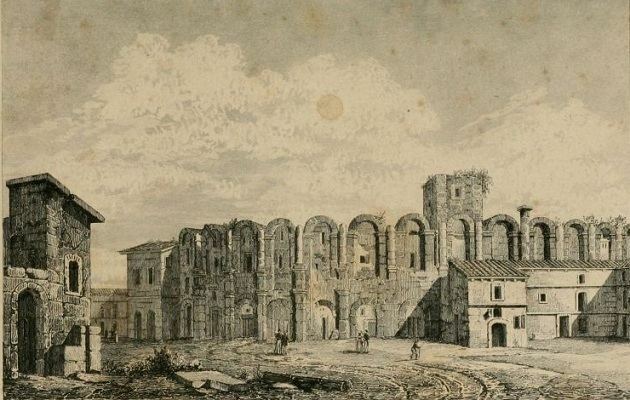 Despite this tension and the city's decline in the face of barbarian invasions, Arles remained a great religious centre and host of church councils (see Council of Arles), the rival of Vienne, for hundreds of years. The Barbegal aqueduct and mill is a Roman watermill complex located on the territory of the commune of Fontvieille, a few kilometres from Arles. 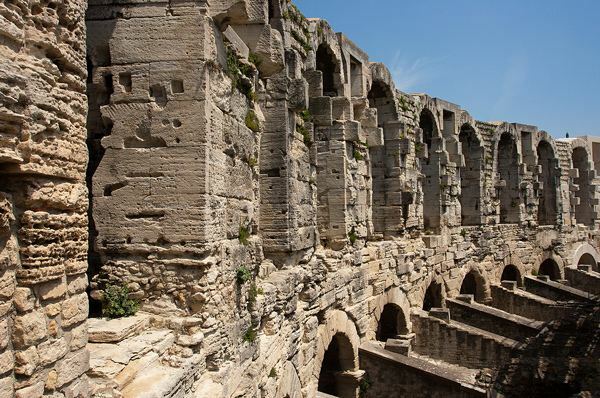 The complex has been referred to as "the greatest known concentration of mechanical power in the ancient world". The remains of the mill streams and buildings which housed the overshot water wheels are still visible at the site, and it is by far the best-preserved of ancient mills. There are two aqueducts which join just north of the mill complex, and a sluice which enabled the operators to control the water supply to the complex. The mill consisted of 16 waterwheels in two separate rows built into a steep hillside. There are substantial masonry remains of the water channels and foundations of the individual mills, together with a staircase rising up the hill upon which the mills are built. The mills apparently operated from the end of the 1st century until about the end of the 3rd century. The capacity of the mills has been estimated at 4.5 tons of flour per day, sufficient to supply enough bread for 6,000 of the 30-40,000 inhabitants of Arelate at that time. A similar mill complex existed also on the Janiculum in Rome. Examination of the mill leat still just visible on one side of the hill shows a substantial accretion of lime in the channel, tending to confirm its long working life. It is thought that the wheels were overshot water wheels with the outflow from the top driving the next one down and so on, to the base of the hill. Vertical water mills were well known to the Romans, being described by Vitruvius in his De Architectura of 25 BC, and mentioned by Pliny the Elder in his Naturalis Historia of 77 AD. There are also later references to floating water mills from Byzantium and to sawmills on the river Moselle by the poet Ausonius. The use of multiple stacked sequences of reverse overshot water-wheels was widespread in Roman mines. In 735, after raiding the Lower Rhône, Andalusian Saracens led by Yusuf ibn 'Abd al-Rahman al-Fihri moved into the stronghold summoned by Count Maurontus, who feared Charles Martel's expansionist ambitions, though this may have been an excuse to further Moorish expansion beyond Iberia. The next year, Charles campaigned south to Septimania and Provence, attacking and capturing Arles after destroying Avignon. In 739. Charles definitely drove Maurontus to exile, and brought Provence to heel. In 855, it was made the capital of a Frankish Kingdom of Arles, which included Burgundy and part of Provence, but was frequently terrorised by Saracen and Viking raiders. In 888, Rudolph, Count of Auxerre (now in north-western Burgundy), founded the kingdom of Transjuran Burgundy (literally, beyond the Jura mountains), which included western Switzerland as far as the river Reuss, Valais, Geneva, Chablais and Bugey. In 933, Hugh of Arles ("Hugues de Provence") gave his kingdom up to Rudolph II, who merged the two kingdoms into a new Kingdom of Arles. In 1032, King Rudolph III died, and the kingdom was inherited by Emperor Conrad II the Salic. Though his successors counted themselves kings of Arles, few went to be crowned in the cathedral. Most of the kingdom's territory was progressively incorporated into France. During these troubled times, the amphitheatre was converted into a fortress, with watchtowers built at each of the four quadrants and a minuscule walled town being constructed within. The population was by now only a fraction of what it had been in Roman times, with much of old Arles lying in ruins. The town regained political and economic prominence in the 12th century, with the Holy Roman Emperor Frederick Barbarossa traveling there in 1178 for his coronation. In the 12th century, it became a free city governed by an elected podestat (chief magistrate; literally "power"), who appointed the consuls and other magistrates. It retained this status until the French Revolution of 1789. Arles joined the countship of Provence in 1239, but, once more, its prominence was eclipsed by Marseilles. In 1378, the Holy Roman Emperor Charles IV ceded the remnants of the Kingdom of Arles to the Dauphin of France (later King Charles VI of France) and the kingdom ceased to exist even on paper. Arles remained economically important for many years as a major port on the Rhône. In the 19th century, the arrival of the railway diminished river trade, leading to the town becoming something of a backwater. This made it an attractive destination for the painter Vincent van Gogh, who arrived there on 21 February 1888. He was fascinated by the Provençal landscapes, producing over 300 paintings and drawings during his time in Arles. Many of his most famous paintings were completed there, including The Night Cafe, the Yellow Room, Starry Night Over the Rhone, and L'Arlésienne. 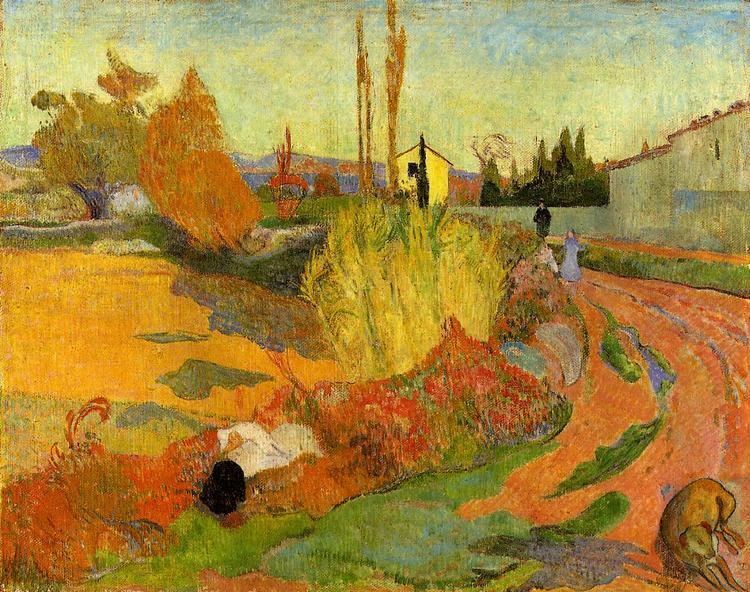 Paul Gauguin visited van Gogh in Arles. However, van Gogh's mental health deteriorated and he became alarmingly eccentric, culminating in the well-known ear-severing incident in December 1888 which resulted in two stays in the Old Hospital of Arles. The concerned Arlesians circulated a petition the following February demanding that van Gogh be confined. In May 1889, he took the hint and left Arles for the Saint-Paul asylum at nearby Saint-Rémy-de-Provence. Arles had an important and evident Jewish community between the Roman era and until the end of the 15th century. A local legend describes the first Jews in Arles as exiles from Judaea after Jerusalem fell to the Romans. Nevertheless, the first documented evident of Jews in Arles is not before fifth century, when a distinguished community had already existed in town. Arles was an important Jewish crossroads, as a port city and close to Spain and the rest of Europe alike. It served a major role in the work of the Hachmei Provence group of famous Jewish scholars, translators and philosophers, who were most important to Judaism throughout the Middle Ages. At the eighth century, the jurisdiction of the Jews of Arles were passed to the local Archbishop, making the Jewish taxes to the clergy somewhat of a shield for the community from mob attacks, most frequent during the Crusades. The community lived relatively peacefully until the last decade of the 15th century, when they were expelled out of the city never to return. Several Jews did live in the city in the centuries after, though no community was found ever after. Nowadays, Jewish archaeological findings and texts from Arles can be found in the local museum. The Church of St. Trophime (Saint Trophimus), formerly a cathedral, is a major work of Romanesque architecture, and the representation of the Last Judgment on its portal is considered one of the finest examples of Romanesque sculpture, as are the columns in the adjacent cloister. The town also has a museum of ancient history, the Musée de l'Arles et de la Provence antiques, with one of the best collections of Roman sarcophagi to be found anywhere outside Rome itself. Other museums include the Musée Réattu and the Museon Arlaten. The courtyard of the Old Arles hospital, now named "Espace Van Gogh," is a center for Vincent van Gogh's works, several of which are masterpieces. The garden, framed on all four sides by buildings of the complex, is approached through arcades on the first floor. A circulation gallery is located on the first and second floors. In September–October 2007, divers led by Luc Long from the French Department of Subaquatic Archaeological Research, headed by Michel L'Hour, discovered a life-sized marble bust of an apparently important Roman person in the Rhône near Arles, together with smaller statues of Marsyas in Hellenistic style and of the god Neptune from the third century AD. The larger bust was tentatively dated to 46 BC. Since the bust displayed several characteristics of an ageing person with wrinkles, deep naso-labial creases and hollows in his face, and since the archaeologists believed that Julius Caesar had founded the colony Colonia Iulia Paterna Arelate Sextanorum in 46 BC, the scientists came to the preliminary conclusion that the bust depicted a life-portrait of the Roman dictator: France's Minister of Culture Christine Albanel reported on May 13, 2008, that the bust would be the oldest representation of Caesar known today. The story was picked up by all larger media outlets. The realism of the portrait was said to place it in the tradition of late Republican portrait and genre sculptures. The archaeologists further claimed that a bust of Julius Caesar might have been thrown away or discreetly disposed of, because Caesar's portraits could have been viewed as politically dangerous possessions after the dictator's assassination. Historians and archaeologists not affiliated with the French administration, among them Paul Zanker, the renowned archaeologist and expert on Caesar and Augustus, were quick to question whether the bust is a portrait of Caesar. Many noted the lack of resemblances to Caesar's likenesses issued on coins during the last years of the dictator's life, and to the Tusculum bust of Caesar, which depicts Julius Caesar in his lifetime, either as a so-called zeitgesicht or as a direct portrait. After a further stylistic assessment, Zanker dated the Arles-bust to the Augustan period. Elkins argued for the third century AD as the terminus post quem for the deposition of the statues, refuting the claim that the bust was thrown away due to feared repercussions from Caesar's assassination in 44 BC. The main argument by the French archaeologists that Caesar had founded the colony in 46 BC proved to be incorrect, as the colony was founded by Caesar's former quaestor Tiberius Claudius Nero on the dictator's orders in his absence. Mary Beard has accused the persons involved in the find of having willfully invented their claims for publicity reasons. The French ministry of culture has not yet responded to the criticism and negative reviews. AC Arles-Avignon is a professional French football team. They currently play in Championnat de France Amateur, the fourth division in French football. They play at the Parc des Sports, which has a capacity of just over 17,000. A well known photography festival, Rencontres d'Arles, takes place in Arles every year, and the French national school of photography is located there. The major French publishing house Actes Sud is also situated in Arles. Bull fights are conducted in the amphitheatre, including Provençal-style bullfights (courses camarguaises) in which the bull is not killed, but rather a team of athletic men attempt to remove a tassle from the bull's horn without getting injured. Every Easter and on the first weekend of September, during the feria, Arles also holds Spanish-style corridas (in which the bulls are killed) with an encierro (bull-running in the streets) preceding each fight. The film Ronin was partially filmed in Arles. Arles played a major role in Marseille-Provence 2013, the year-long series of cultural events held in the region after it was designated the European Capital of Culture for 2013. The city hosted a segment of the opening ceremony with a pyrotechnical performance by Groupe F on the banks of the Rhône. It also unveiled the new wing of the Musée Départemental Arles Antique as part of Marseille-Provence 2013. Arles's open-air street market is a major market in the region. It occurs on Saturday and Wednesday mornings. The Gare d'Arles railway station offers connections to Avignon, Nîmes, Marseille, Paris, Bordeaux and several regional destinations. Vincent van Gogh, lived here from February 1888 until May 1889. Luc Hoffmann, ornithologist, conservationist and philanthropist. Samuel ibn Tibbon, famous Jewish translator and scholar during the Middle Ages. Kalonymus ben Kalonymus, famous Jewish scholar and philosopher, Arles born, active during the Middle Ages.